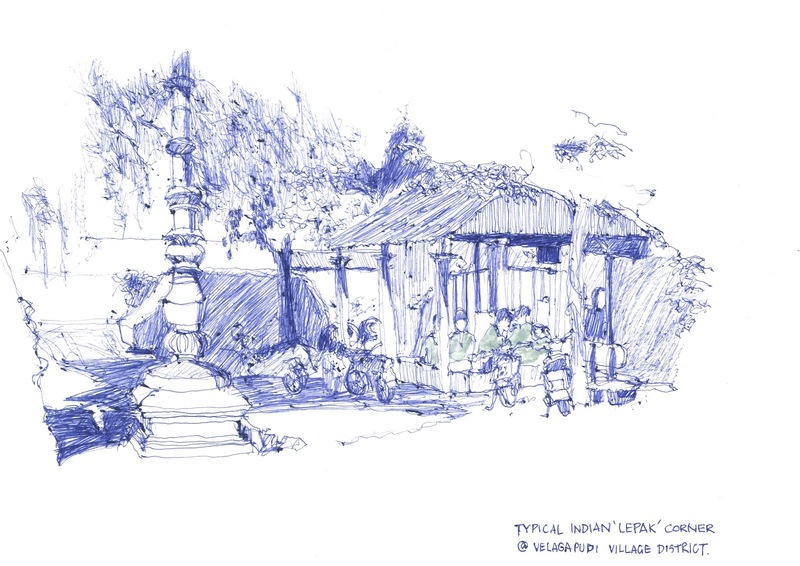 [Guest post by Tony Chua in Andhra Pradesh, India] The Institution for Development in Singapore invited me and a team of 11 Urban Sketchers from Singapore and Mumbai to Vijayawada in southern India to sketch the area where the modern city of Amaravati is being developed. Development will alter some, particularly the more rural areas, and our mission is to record what we see as it stands today. 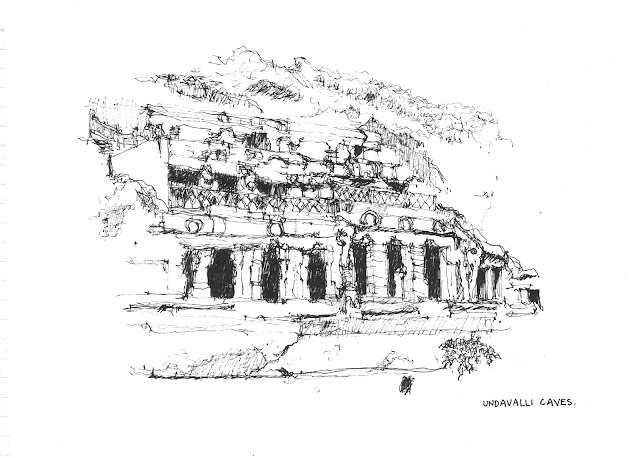 I felt awe at the magnificent sight of Undavalli Caves, carved out of a solid rocky hillside. It being a Sunday, many families visited that day. They surrounded me, looking at and taking shots of my sketch. But I was focussed on keeping my distance from a group of monkeys scampering around. This elegant railway station shows British architectural influences. There are about 250 trains passing through the station every day. 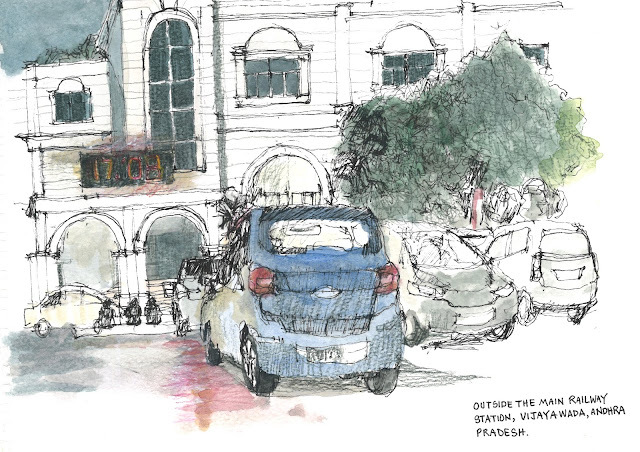 Just imagining the crowds inside the station made my head spin, so I sketched the exterior. This was my first time setting foot in a local village, and I came with an open mind. 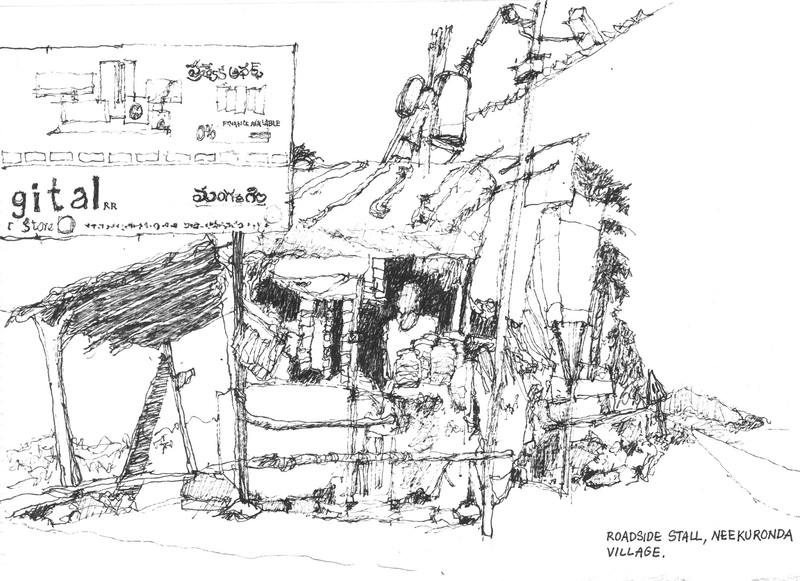 The village had many statues of religious idols and local folk heroes erected on roadside corners. These statues are common sights in many other villages here. In Kuragallu Village, it was intriguing to see the communist symbols painted on tiered steps. We experienced down-to-earth village hospitality when we were served hot masala chai. That surrounding area with a lonely outpost stall would soon be a thing of the past, so for us, it was naturally best to capture it. 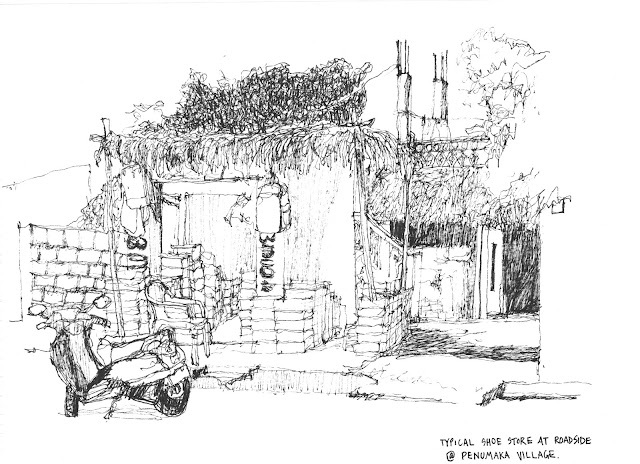 This stall was located in the rural countryside, so we assumed it might be a quiet spot, but halfway through my sketch our presence attracted 100 pairs of eyes, all come to watch us sketch. 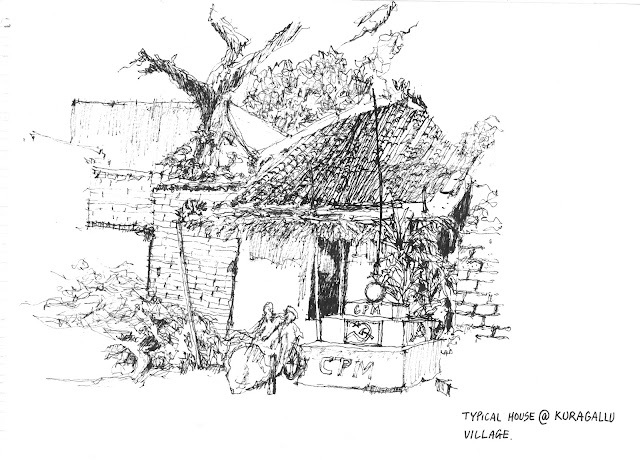 In every village we were visiting, there were small sheltered huts hidden away from the main roads and often under huge trees to escape the heat. These huts are set up as meeting points for men to talk and take a siesta. These are two houses in the village of Krishnayapalem. 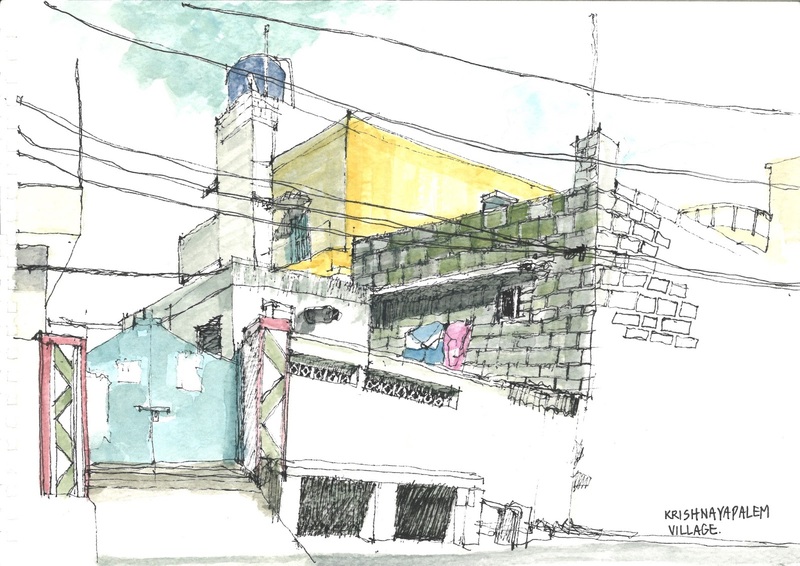 The different facades perhaps reflect the status of the house owners. The second house was lucky to have its own generator and huge water tanks on the roof. Most villagers share a common water hand pump. Some walk long distances to get their daily water supply. It was so awesome to see the whole of Vijayawada City from Gandhi Hill Park on my final day in India. I had a powerful urge to sketch, despite the fading light. I left with wonderful memories. After his retirement in 2008, Tony Chua joined Urban Sketchers Singapore. 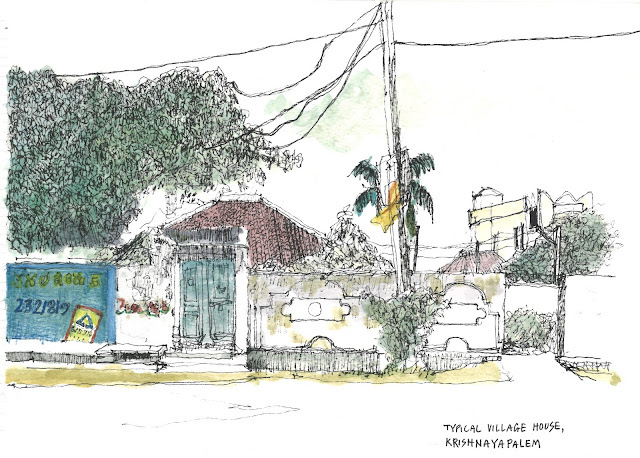 His favourite subjects are the colourful shophouses of Singapore and the boats and marinas. He has participated in Urban Sketching Symposiums in Barcelona, Singapore and Manchester.